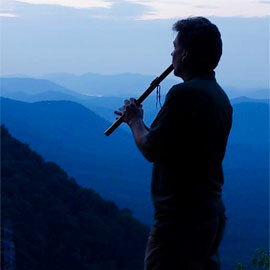 Hawk Hurst has a real passion for Native American-style flutes and drums. He has been playing and crafting them, as well as teaching others how to create their own, for three decades. 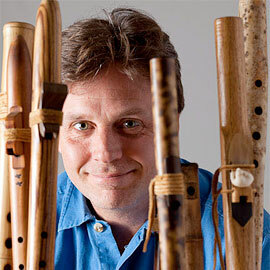 Originally self-taught, Hawk is forever grateful to the assistance he received in learning to craft flutes, from both Eddie Bushyhead, Oreo Van Doren, & Hawk Littlejohn. His playing was influenced by his good friends, Snowbear Taylor and Frank Chambless, in addition to, the early recordings of R. Carlos Nakai and Bob Two Hawks. 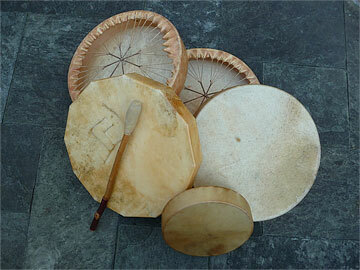 Hawk first studied Native American-style drum making, in 1987, with Northwest Coast drum-maker, Jim Hickey. Hawk’s educational background includes a Masters of Science degree in Environmental Education from Lesley College and the Audubon Expedition Institute, as well as undergraduate degrees in Psychology and in Political Science from the University of Oklahoma. He is a nine time recording artist and is the author of two published children’s books. Hawk has long worked in the field of Environmental Education. He continues to lead nature hikes, as well as teaching ancient living skills at outdoor centers such as the Green River Preserve, Firefly Gathering, and Earth Skill Rendezvous. He and his wife, Ayal, were the co-founders and former directors of a unique, non-profit summer camp and outdoor education center, known as Silver Water Retreat. The summer camp programs, known as Earth Camp, have been ongoing for over two decades and are now held at Buffalo Cove Hollow. Hawk has long served in the field of environmental education and as an artist in residence in both public and private schools, where he has specialized in sharing stories and folk art inspired by Native American and African cultures. He continues to lead exploratory nature hikes, teach primitive living skills, and share stories and songs at a number of outdoor education centers and summer camps across the Southeast. Hawk and his wife, Ayal, currently own and operate Homestead Retreat - a beautiful organic farm and holistic healing center, West of Asheville, North Carolina. A wide variety of classes and gatherings are offered May through October of each year, with internships available through the WWOOF (World Wide Organization of Organic Farms) program. To learn more, visit: http://www.homesteadretreatathorsefork.com/homestead-retreat.html. ©2019 Hawk Hurst Flutes, Charleston, SC. All Rights Reserved. 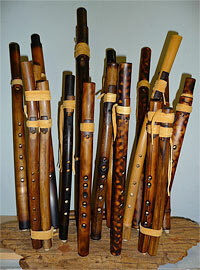 Native American Style Flutes - Rivercane Flutes - Storytelling - Performing Artist.